In an article carried by many websites, John Parmentola, a senior vice president of the San Diego-based General Atomics, described a composite ceramic material, silicon carbide, which can sustain over 2,000 degrees Centigrade without showing any effect of strain or fatigue, as opposed to the metals that show fatigue at 700 degrees C.
Because of this development, Parmentola said General Atomics is working to develop a new nuclear reactor concept with potentially far-reaching performance advantages. This reactor, Energy Multiplier Module (EM squared), is the smallest-size, highest-efficiency, and highest-power small modular reactor in the world. It relies on a high operating temperature of 850 degrees Centigrade to increase efficiency, reduce waste, and even to use nuclear waste as fuel. It is designed to work for 30 years without refueling, relying on a silicon carbide fiber ceramic that will hold the fuel pellets. “This innovation comes at a time when nuclear energy has reached a crossroads. So we have a choice: Embrace new technology, as we have in the past, to improve performance, or continue to look in the rear-view mirror with ideas that just hold back human progress,” Parmentola noted. The Energy Multiplier Module (EM2 or EM squared) is a nuclear fission power reactor under development by General Atomics. It is a modified version of the Gas Turbine Modular Helium Reactor (GT-MHR) and is capable of converting spent nuclear fuel into electricity and industrial process heat, without separative or conventional nuclear reprocessing. operates at high temperatures yielding approximately 50 percent greater efficiency and a corresponding one-third reduction in materials requirements than that of current nuclear reactors. 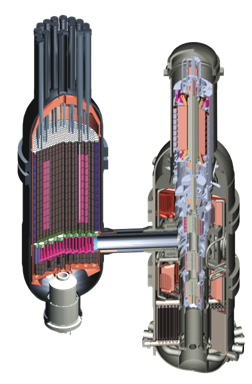 The EM2 utilizes used nuclear fuel, also referred to as “spent fuel” from light water reactors. By using spent nuclear waste and depleted uranium stockpiles as its fuel source, a large-scale deployment of the EM2 is expected to reduce the long-term need for uranium enrichment and eliminate conventional nuclear reprocessing. EM2 technology is designed to be inherently safe and to automatically shut down using the natural laws of physics. Disclaimer: The views expressed in these articles are the sole responsibility of the author(s) and do not necessarily reflect those of CanadaNewsLibre. The contents of these articles are of sole responsibility of the author(s). CanadaNewsLibre will not be responsible or liable for any inaccurate or incorrect statements. The CNL grants permission to cross-post original CanadaNewsLibre articles on community internet sites as long as the text & title are not modified. The source and the author’s copyright must be displayed. canadanewslibre.com may contain copyrighted material the use of which has not always been specifically authorized by the copyright owner. We are making such material available to our readers under the provisions of “fair use” in an effort to advance a better understanding of political, economic and social issues. The material on this site is distributed without profit to those who have expressed a prior interest in receiving it for research and educational purposes. If you wish to use copyrighted material for purposes other than “fair use” you must request permission from the copyright owner. This entry was posted in Science and Technology and tagged ceramic, human progress, John Parmentola, nuclear reactors, silicon carbide by cnlib. Bookmark the permalink.